Dempsey, Hugh A.. "Blackfoot Confederacy". The Canadian Encyclopedia, 04 October 2018, Historica Canada. 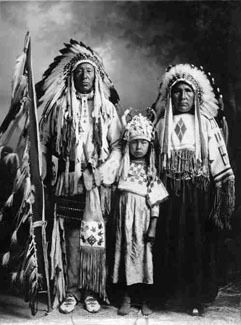 https://www.thecanadianencyclopedia.ca/en/article/blackfoot-nation. Accessed 20 April 2019. Traditional territory of the Blackfoot Confederacy. The traditional territory of the Blackfoot Confederacy has been described as roughly the southern half of Alberta and Saskatchewan, and the northern portion of Montana. In the west, the confederacy was bounded by the Rocky Mountains and its eastern limits stretched past the Great Sand Hills of eastern Saskatchewan. Their hunting area included the rich bison ranges of southern Alberta and northern Montana. In the 2016 census, 22,490 people identified as having Blackfoot ancestry. 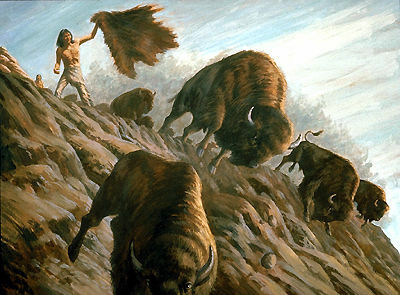 This drawing shows how completely the Plains Indians such as the Blackfoot, Blood, Dakota Peigan and Sarcee depended on the bison (artwork by Gordon Miller). 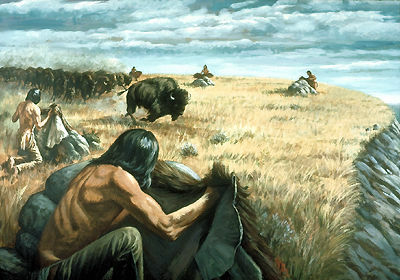 Traditional Blackfoot culture is based on the bison hunt, intrinsically linking them to the Plains. They lived freely on the land, following bison across the plains to hunting grounds where they would utilize bison jumps and runs. 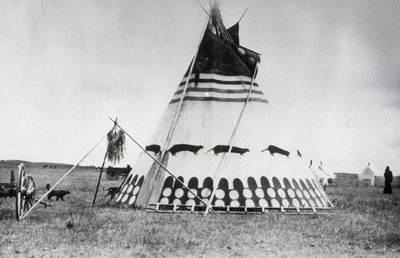 Because of their portability, Blackfoot people lived in camps sheltering in tipis. They also hunted other large game such as deer, supplementing their diet with nuts, fruits and vegetables. 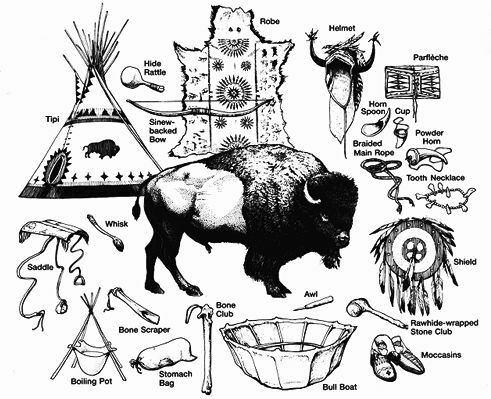 The bison remained the most important element of their economy, diet and way of life. The Blackfoot were also known for being fierce warriors with a powerful alliance system that included not only the nations of the confederacy, but other Athabaskan nations, such as the Tsuut’ina. Warriors were revered among the people, and belonged to sacred societies that honoured and tested their courage and skill. Despite significant population loss as a result of warfare, the Blackfoot Confederacy remained one of the most powerful Indigenous groups on the Northern Plains, temporarily impeding the westward expansion of European settlers. Among the Blackfoot, circa 1908 (photo by Trueman, courtesy Library and Archives Canada/C-14106). During the summer, groups would converge to hunt bison, and celebrate with elaborate feasts and dances. 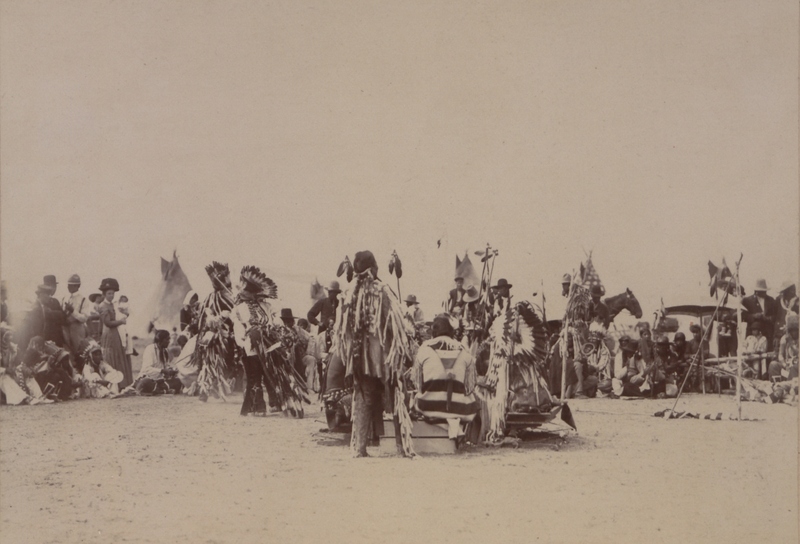 The Sun Dance, a communal celebration held annually in mid-summer, was the central aspect of Blackfoot cultural life. European settlers and missionaries opposed the Blackfoot’s complex and well-established traditions. Assimilatory laws and policies were implemented in order to eradicate the expression of traditional culture. (See also Indian Act and Residential Schools.) However, Blackfoot oral histories passed cultural traditions on to future generations, including participating in sweat lodges and sacred societies (such as the Horn Society), using medicine bundles, and other means of purifying the body and soul. Although creation stories differ across the Blackfoot nations, they generally believe that the Creator (also known as Old Man or N’api) was believed to be light personified, and was therefore also considered to be the beginning of the day, the beginning of life. As in other Indigenous religions, the Creator is non-human and non-gendered. Old Man created and is eternally part of all the living people, creature and life forms on the earth. The Blackfoot language is part of the Algonquian linguistic group. It is spoken by the three nations of the Blackfoot Confederacy with only slight variations in dialect. There are a few linguistic differences among the Blackfoot dialects. Lexical differences (i.e., uses of different words for the same reference, or different meanings assigned to the same word) involve words that are not part of Indigenous culture. For example, the word for “ice cream” in Kainai is sstónniki (literally “cold milk”) and áísstoyi in Siksika (literally “that which is cold”). Dialectal grammars also have different gender divisions (i.e., masculine/feminine/neutral and animate/inanimate). For example, the word for ashtray in Kainai — iitáísapahtsimao'p — is of animate gender; in Piikani, the same word is of inanimate gender. The phonology (systems of sounds) also differs between tribes, but generally speaking, Siksika, Kainai and Piikani peoples can understand one another. Residential schools and other cultural assimilation policies eroded traditional language usage and cultural practices. In 2016, Statistics Canada reported that 5,565 people identified as speakers of a Blackfoot language, with 98.7 living in Alberta. However, this figure does not specify the number of fluent speakers. Considered an endangered language, several language programs exist to promote its resurgence. Indeed, the Alberta Ministry of Education, through consultation with Blackfoot elders and educators, provides full curriculum support for Blackfoot language education from kindergarten to grade 12, for both Indigenous and non-Indigenous students. 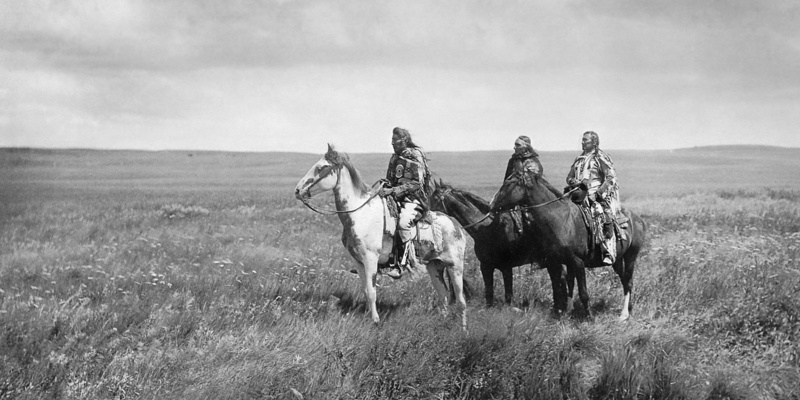 The influence of Europeans in North America preceded contact with the Blackfoot Confederacy. Though the first European traders did not encounter Blackfoot peoples until the mid-18th century, horses	— brought to North America by the Spanish — probably reached them via trade from the west between 1725 and 1731. Around the same time, they received firearms from neighbouring Cree	and Assiniboine traders. Throughout most of the 18th and 19th centuries, the equestrian Blackfoot dominated their hunting area and were almost constantly at war with the Cree, Assiniboine, Crow, Nez Percé, Shoshone and other nations. They frequented the Hudson's Bay Company and North West Company	posts on the North Saskatchewan River, but fought with US trappers and free traders in the south until 1870 when American troops massacred about 173 Piikani people at Fort Ellis in present-day Montana, according to a US Military officer. 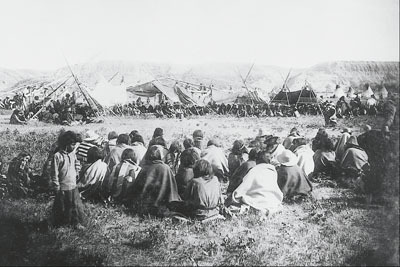 Piikani witnesses claimed the dead numbered about 220 people. The confederacy’s population varied over this period, with estimates ranging from as high as 20,000 in 1833 and as low as 6,350 after the 1837 smallpox epidemic. From the late 18th to mid-19th century, both the Tsuut’ina and the Gros Ventre people, though culturally and linguistically distinct from the other Blackfoot nations, were allies of the confederacy for political reasons. Facing the reality of dwindling bison herds and increased European settlement — both encouraged by opportunistic settler governments — the Blackfoot were faced with minimal options, and sought cultural and political protection in their homelands. The Blackfoot signed a treaty with the American government in 1855, and in 1877 signed Treaty 7 with the Canadian government. Most of the Piikani settled on a reserve in Montana — in 2010, the Indigenous population of this reserve was more than 9,000 — while the Siksika, Kainai and North Piikani nations each established reserves in southern Alberta. By the end of the 1800s, the bison were disappearing on the plains. In addition, the reserves effectively put an end to traditional ways of life, including the bison hunt. The confederacy struggled to survive on reserves without the ability to hunt bison. Historians commonly refer to the winter of 1883–84 as the “starvation winter” because of the widespread hunger that plagued the confederacy that season. 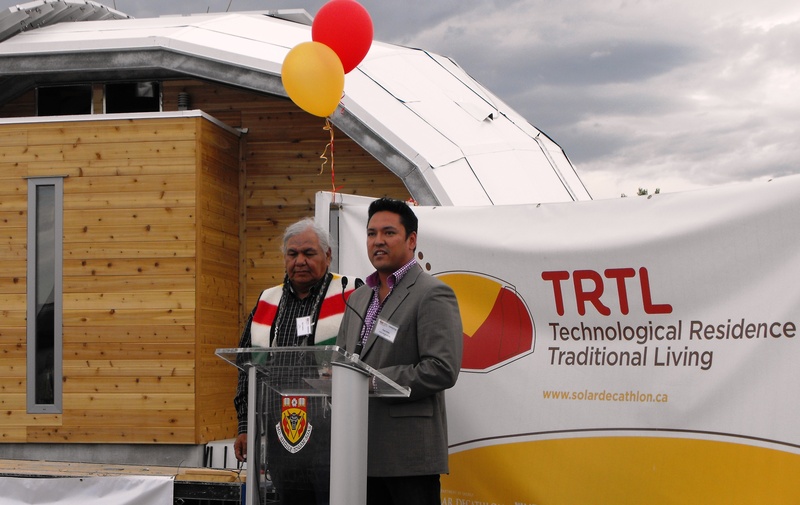 Spiritual-Cultural Advisor Dr. Reg Crowshoe and CEO Ryan Robb, Treaty 7 Management Corporation (7 July 2011). The Blackfoot nations have been able to retain much of their traditional culture in the face of adversity. Today, the Blackfoot nations are vibrant communities that emphasize traditional culture in education, wellness and healing programs, and in other aspects of daily life. Many Blackfoot people rely upon ranching and farming, but also operate Indigenous-owned businesses in areas like tourism, and resource extraction and management. Politically, the Blackfoot nations are represented through elected chiefs and councils, as well as through the Treaty 7 Management Corporation, which provides advocacy and advisory services. 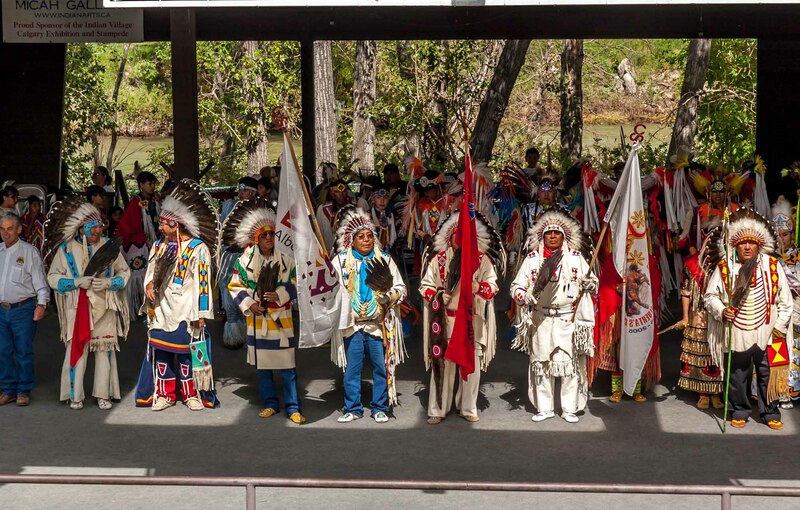 The Blackfoot Confederacy itself is the source of some political momentum, with yearly conferences held among member nations that aim to facilitate greater collective organization and influence. Member nations have also independently negotiated and achieved victories with provincial and federal governments with respect to self-governance, self-determination and land claims, among other issues. In 2014, the confederacy joined other First Nations in signing the Iinii Treaty or Buffalo Treaty, including: the Blackfeet Nation (American band), Assiniboine and Gros Ventre Tribes of Fort Belknap Reservation, Assiniboine and Dakota (Sioux) Tribes of Fort Peck Reservation, Confederated Salish and Kootenai Tribes (see also Coast and Interior Salish), and the Tsuut'ina Nation. In 2015, the Stoney Nakoda Nation and the Samson Cree Nation also signed this “open treaty,” which is open to other First Nations	from Canada and the US. Among other issues, the signatories agreed to unite the political power of Northern Plains Indigenous nations, work towards bison conservation and strengthen traditional relationships to the land. Blanca Tovías, Colonialism on the Prairies: Blackfoot Settlement and Cultural Transformation, 1870 —1920 (2011). Mary Stout and Helen Dwyer, Blackfoot History and Culture (2012). 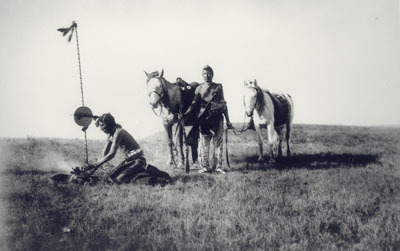 Hugh A. Dempsey, Indian Tribes of Alberta (1979). J.C. Ewers, The Blackfeet: Raiders of the Northwestern Plains (1958). BlackfootSee a profile of current Blackfoot language use in North America. From Ethnologue, a reference source about known living languages. CrowfootUne biographie de Crowfoot, chef pied-noir, du Dictionnaire biographique du Canada. Piikani NationThis site provides the latest news about Piikani Nation, a member of the Blackfoot Confederacy since 1877. CrowfootA biography of Blackfoot chief Crowfoot. From the Dictionary of Canadian Biography Online. Siksika NationThe home site for the Siksika Nation Administration. Click on “About” for an illustrated history of the Blackfoot people (the Children of the Plains). Treaty SevenSee this site for a history and text of Articles of Treaty No. 7, a peace treaty made between the tribes of the Blackfoot Confederacy and the Government of Canada in 1877. Click on “About Us’ for information about individual Treaty 7 Nations. Blood Tribe / KainaiThe website for the Blood Tribe / Kainai, considered to be the oldest residents of the western prairie region. Offers information about tribal programs and services as well as links to past copies of their Tsinikssini news magazine.